A few years ago I took on a research challenge: to listen to every charity single released in the United Kingdom between December 1984 and the end of 1995. I ended up studying 82 singles in depth—some had international success, some were made for local community audiences. Charity singles are the songs specially recorded by musical artists to benefit charitable causes. 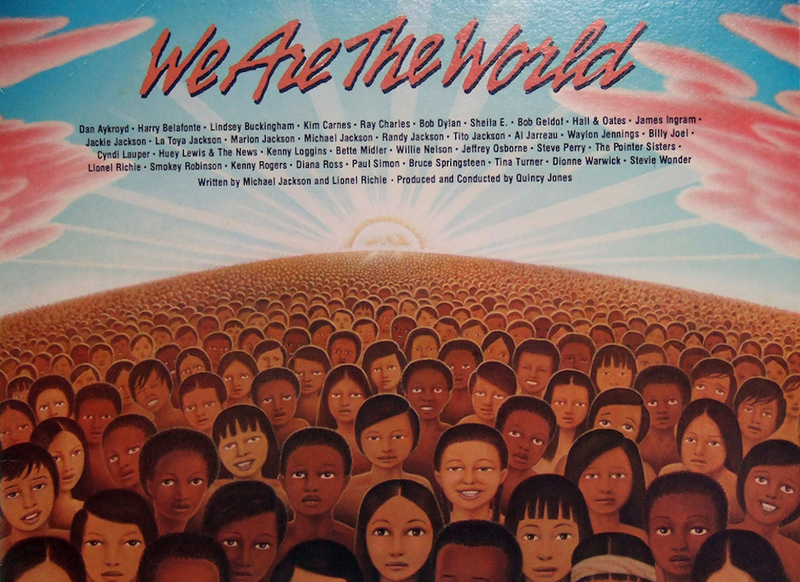 Perhaps the best known are 1984’s Band Aid, which sang “Do They Know It’s Christmas?” about Ethiopian hunger, and 1985’s “We Are The World,” recorded on behalf of Africa. Critics have never warmed to the genre, but I surprised myself by growing attached to a number of them. Not only do they tend to have the hookiest of choruses, but there is also something particularly pleasurable about music that makes no effort whatsoever to be cool. In a cynical, highly marketed, autotuned, and media-managed music world, singers prepared to just turn up and belt out a chorus seem endearing. They have an appealing lack of glossiness, and even an artificial show of sincerity is more attractive than posed irony. But there is one thing that is clear when you listen to charity singles. Most are bad. Very bad. Being bad was evidence that a single was thrown together to confront an emergency, with the participating artists typically lowering their usual standards. Bad was kind of the point; the rough production values demonstrated that no money was spent, much less wasted. In fact, the ones that were any good musically were usually unsuccessful. There had been musical fundraisers before the 1980s. Pete Seeger, Woody Guthrie, and Leadbelly did a benefit show for California’s Dust Bowl refugees in 1940. Elvis did a 1961 benefit concert in Hawaii for the U.S.S. Arizona Pearl Harbor memorial and George Harrison did a 1971 concert for Bangladesh. But it was in the ‘80s that the charity single came into its own. Benefit songs sold philanthropy and Victorian values, raising funds for traditional causes such as Great Ormond Street Hospital in London, but in a style that appealed to youth-oriented broadcasting and made use of videos, which were then new. Charity singles are never just about the money, though. They have an old-fashioned moral message and an idealistic take on the need for social change straight out of Dickens. These songs are statements—about who we think we are as a society, how we want to be seen, and which people in need we think we can “help.” “We Are the World”, we are reminded. “Do Something Now” for Christian Aid. “You’ll Never Walk Alone” for the Bradford Football Disaster. The songs themselves created a utopian sense of community, however artificial, between donors and an imagined community of worthy recipients. There was a recipe for building the perfect 80s charity single. Take an eclectic group of musicians who shouldn’t really get along. Include individual voices that have standout lines (good options are Boy George, Bruce Springsteen, and Sting). One participant must look as if they are taking their part too seriously, and one person must look as if they are not taking their part seriously enough. And there should be a video in which microphones, leads, lyric sheets, and producers are visible, as well as a collective chorus shot including people who did not necessarily perform on the record. Your group of singers should include someone old, someone new, someone with genuine credibility, someone surprising, and a puppet. The puppets from the British satire Spitting Image appeared in the videos for charity singles, including Genesis’ 1986 song raising awareness of Middle East policy, “Land of Confusion.” (The puppets also made their own spoof charity single in 1990). The Muppets have had a good run in charity singles too, from the ‘80s to the present day. More recently their theme tune was re-recorded to raise money for a New Zealand cancer charity, and Kermit the Frog performed a duet of “Rainbow Connection” with Ed Sheeran for Red Nose Day, a song that the Muppets and their fans have used to raise charity funds and awareness since the 1980s. To go with the self-consciously eclectic stars, ‘80s charity single videos were produced in a deliberately slipshod way to emphasize the time and labour donated by musicians, producers, and technicians. The urgent nature of production was made clear in wilfully unprofessional-looking videos, thrown together in a hurry. Viewers got to see the nuts and bolts of the recording process, often with a motley skeleton crew portrayed mucking around together. In fact, the more uncomfortable the style pairings and the less likely the performers to work together normally, the clearer their own charitable donation was. The eclecticism of performers also made it easier to market a charity single broadly. Whether it’s the performers singing together, the consumers buying the records, or the imagined recipients, everyone was part of the same community, headed up by the Muppets and Boy George. We weren’t just buying a single, we were buying a moral community. At a time when there was no such thing as society and greed was good, charity singles reminded us that there was another way, not perfect of course, but a statement of intent. The problem with this recipe was that it became too familiar; once the format was instantly recognizable, charity singles lost their sense of spontaneity, their heart—and their charity. Since that ‘80s heyday, and up to the most recent wave of recordings, the most significant charity single releases have been corporate events for corporate-style charities attached to telethons like Red Nose Day, Children in Need, or Band Aid reboots. These events are not the spontaneous thrown-together responses to crisis, but professionally organized and carefully planned and executed. Recent charity singles have been linked to reality TV show brands like The X Factor and BBC Music, rather than being built from particular pop tribes. The X Factor finalists used to produce a charity single and music video before the final winner of the show was anointed. Making it through the live rounds to perform on the video was a badge of honour in itself. For The X Factor contestants, the charity single was a bridge into a professional music career. There is no awareness to be raised. There is no community to be built. There is a television event to be marketed. Recently, the charity single has made a comeback as artists step away from the corporate event model to create moments of intensely shared feeling. Once again, some charity singles seem to be about community and finding common ground amidst the shock waves of terrorism, mass violence, and climate change. Portishead, for example, has dedicated its haunting new ABBA cover “SOS” to the memory of Jo Cox, Labour MP, who was shot dead in the run up to the Brexit referendum. Adele and Christina Aguilera both used recent performances to express their reactions to the shooting in Orlando, Florida that killed 49 people at Pulse nightclub. Indeed, Orlando may be a turning point for the charity single. The multiple charity singles for the Pulse shooting victims have not only been good, but also sung by the right people. After Orlando, a vigil was held in London’s ‘gay village’ on Old Compton Street in Soho, which was the scene of a violent hate crime in 1999 when 39 people were injured by a politically motivated nail bombing. The London Gay Men’s Chorus performed at the Orlando vigil, singing “Bridge Over Troubled Water,” and the live performance captured a feeling of shared vulnerability and collective resilience. Their recording of a charity single marks the arrival of a transatlantic LGBTQ community. It will raise funds for both the Pulse Victims Fund and a British-based charity fighting hate crime. The most striking example of what a charity single can do now is the recording of Bruce Bacharach’s “What the World Needs Now” by 60 Broadway stars to raise money for the LGBT Centre of Central Florida. “Broadway for Orlando” contains touches of the Band Aid template. It was recorded in one sitting and the recording studio is the focus of the video. We see shots of the mixing desk. And while some of the singing leaves a bit to be desired, this is not a re-enactment of the ‘80s cliché. Whoopie Goldberg and Sarah Jessica Parker might not compete vocally, but they understand the point of a good cameo. This record is an authentic outpouring by a community with deep-rooted connections to the recipients of funds raised. This is the charity single at its best. The Orlando charity singers are singing for themselves, and singing resilience into their communities. United in a choir of voices, the Orlando singles find a way to give voice to victims of the unspeakable. Dr. Lucy Robinson is a Senior Lecturer of Modern British History at the University of Sussex and co-organizer of the Interdisciplinary Network for the Study of Subcultures, Popular Music, and Social Change.